An electrician knows that their education never truly ends. As electrical systems grow more sophisticated and complex, so too must an electrician’s knowledge of their chosen craft. Full-time electricians may find it difficult to find a moment to study up on the latest tricks and techniques, especially if they’ve been out of school for a while and don’t know which texts are currently regarded as the industry standards. By directing the electricians on your team to the resources below—or even by purchasing the texts for them—you’ll make an important investment in their professional development, an investment that will pay off as their value to your company increases. In some cases, your investment need not even require a financial hit. Study.com offers free public courses on topics ranging from algebra to poetry. Their catalog includes several courses that deal with electronics and electrical technology. Two of them, “Soldering Guide” and “Circuits and Electronics,” were created by the Massachusetts Institute of Technology. Both represent great ways for your electricians to brush up on the basics. Those looking for something a little more advanced may find “Circuit Theory” or “Lessons in Electric Circuits” of interest. With so many options, you can find relevant courses for everyone, not just the college types in your employ. While some courses gear towards experienced and formally-trained electricians, others aim to satisfy those learning at a high school level. No matter the expertise of your electricians, through Study.com they’ll find resources that can help them learn new skills or master some old ones. Speaking of the basics, your electricians must continuously ensure that their work remains up to code on every project they take on. Doing so, however, requires that electricians review that code every once in a while. The latest edition of the National Electric Code (released by the National Fire Protection Association) represents the newest and most comprehensive collection of safety guidelines on the market, an exhaustive tome that covers requirements for residential, commercial, and industrial electrical installations. A panel of experts reviews every one of those requirements to ensure that all the information contained in this handbook stays as accurate and up-to-date as possible (a prime concern given the rapidity of change in modern electrical systems). Even if your electricians claim to know their guidelines forwards and backward, it’s still best to have a copy of this book somewhere in the shop. The first edition of Practical Electrical Wiring was written in 1939. Ever since, industry pros have considered it an essential text for electricians, both amateur and professional. Now in its 22nd edition, this industry standard contains all the knowledge needed to work with modern electrical wiring systems. At the same time, it retains the wealth of basic, irreplaceable information that remains as true now as it did almost eighty years ago. The most remarkable feature of this book? It manages to convey that information in a much more interesting and relatable way than most texts. The professional yet down-to-earth tone makes the nearly-overwhelming amount of knowledge offered within seem well within the reader’s grasp. From expert electrician with many years under their belt to total beginners who don’t know a solder from a seder, this book remains valuable. If your electricians were formally educated, there’s a good chance that they encountered this book during their studies (and an even better chance that they’ll appreciate exposure to the newest edition). Base knowledge of circuits and wiring can only get you so far. Any electrician worth their salt needs to put that knowledge to use in practical applications, especially if they work for a field service company like yours. If electricians on your team need that extra assistance in putting their knowledge to good use, you can’t go wrong by getting them a copy of the newest edition of Electrical Motor Controls for Integrated Systems. Your clients, after all, don’t want you to fix a malfunctioning electrical component so much as they want you to fix the machine or system to which that component belongs. By studying this text, your electricians will familiarize themselves with the inner workings of modern motor controls and integrated system technologies. That information will serve them as an excellent reference when they must repair unfamiliar machinery, expanding their skill base and allowing you to take on a greater variety of clients. As the owner of a field-based electrical services company, your goals certainly include seeing your business prosper and expand for years to come. The easiest way to do this involves ensuring that your electricians have the resources they need to grow right along with your company. Ensure that their skills and education keep up with the rapidly-changing world of electronics. 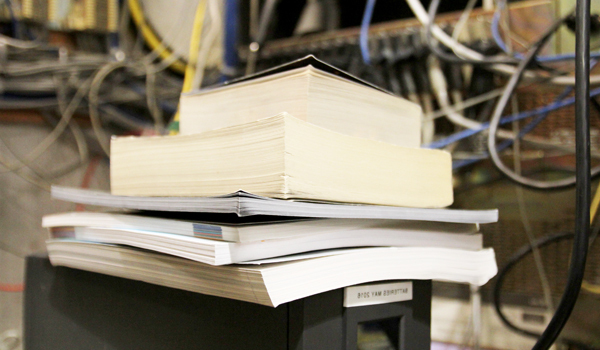 Keep these books in your office for your electricians to study at their leisure—you may even consider getting one or two of them for each member of your team as holiday gifts. If you’d like more tips on successfully operating an electrical services company, please consider visiting our blog or reaching out to one of our knowledgeable industry experts.